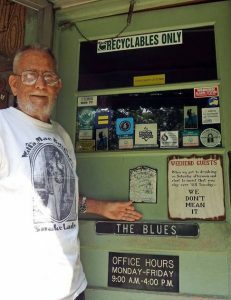 Greensboro, North Carolina – Long time blues authority and past president of the Piedmont Blues Preservation Society, Ralph Speas died on Friday, October 21st, 2016 at the Beacon Place of Hospice and Palliative Care of Greensboro from an accumulation of ailments. Speas moved to Greensboro in 1967, and although not a musician himself, began to accumulate a vast knowledge of local music. He became an expert on Piedmont blues, jazz and roots music of all kinds. Speas was a member of the Board of Trustees of the Piedmont Blues Preservation Society, their former President and acting archivist for more than 20 years. The society also organizes the annual Carolina Blues Festival. A man of many parts, Speas lived an extraordinary life. Before moving to Greensboro, he was a collegiate wrestler, traveled the world, served on the crew of a two masted sailing ship, was a research diver in Jamaica, and even played checkers with actor Anthony Quinn on a movie set. Emily Edwards, a professor of media studies at UNC-Greensboro, interviewed Speas for her book, Bars, Blues, and Booze: Stories from the Drink House. He became her blues mentor on several other projects including the films, Root Doctor, Scripture Cake, and Bone Creek, in which he made an on-screen appearance. One of his favorite artists was Delta bluesman, Super Chikan, and even as Speas’ health began to fail, he attended every performance of his, at September’s National Folk Festival. Loved and respected by all, Speas died, “surrounded by love, dignity, and peace,” said his daughter, Rebecca Kress. Many local singers came to his room to serenade him over the last few weeks. His lawyer, and longtime friend, Stan Atwell, confirmed that Speas had asked that his body be donated to science, and that family and close friends plan a private memorial gathering a later date. Previous articleFans Go ‘Wild’ Over Joanne Shaw Taylor’s Latest Release!